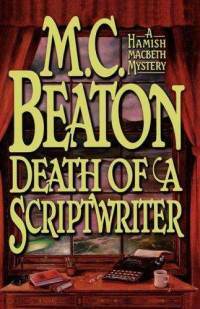 Death Of A Scriptwriter is the fourteenth book in the Hamish Macbeth detective series by M.C. Beaton. When a troop of filmmakers invade the Highlands to film a television show based on a famous mystery book series, the town of Lochdubh becomes obsessed with the concept of Hollywood entering their lives. However, the author of the mystery series is largely upset that the filmmakers have decided to turn her book plot and characters into comic mockery. Soon, the author is murdered for getting in the way of filming, and Hamish Macbeth is made to investigate the murder. Fans of Hollywood pop-culture will eat up Death Of A Scriptwriter, especially since the quirky Lochdubh residents are so far off the mark with pretending to be of the elite film-industry. Several of the village women even go so far as to make their own film. Although Death Of A Scriptwriter is part of a series, this installment is so fun and quirky that it can definitely be read as a stand-alone. This one is not to be missed! What are your favorite cozy mystery novels? Who is your favorite mystery author? Share your thoughts with us in the comment section below.